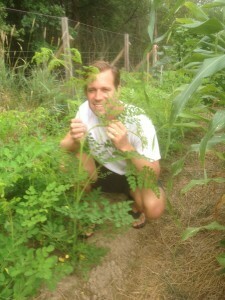 Dr. Eric Brown, from Grace Church in Bath, Ohio, (Jeff Bogue, pastor) holds a moringa plant. Tonight is the CPR-3 Fundraising Banquet in Ephrata, Pa. “Great night of fun, friends, food and fellowship,” says Dan O’Deen, founder and executive director. CPR-3, a cooperating ministry in the Fellowship of Grace Brethren Churches, has begun to explore the uses of the moringa tree in battling malnutrition in Haiti. Here’s a recent update. Its green leaves and normal appearance distinguish a Moringa tree. However, it is not simply just another tree. Only recently it was discovered that the Moringa tree, which grows only in tropical or subtropical climates, has the potential eradicate malnutrition. The protein, amino acids, vitamins and minerals found in its leaves cannot be compared with anything else. For example, the leaves of a Moringa tree contain “seven times more vitamin C than in an orange, four times more vitamin A than in a carrot, and four times more calcium than in milk,” according to Dan O’Deens, executive director of CPR-3, the organization that hopes to bring this product to market in Haiti in the near future. CPR-3 is dedicated to the Moringa Project and wants to see its full potential met. It has focused on securing the land required for planting while creating programs making sure that those who need the nutrients from the tree are receiving it. In addition, this project is creating many more job opportunities for Haitians, according to O’Deens. The organization is now seeking to plant more of these trees wherever they are most needed. Right now CPR-3 may have “the potential to eradicate malnutrition in all of Haiti,” but the organization’s long-term goal is to do the same globally. CPR-3 is a faith-based organization with a mission to support relief, rehabilitation and development in areas or countries facing extreme poverty, crises or catastrophe. A cooperating organization in the Fellowship of Grace Brethren Churches, it is involved in multiple projects around the world, providing job opportunities and clean water for third world countries, as well as food and nutrition for starving children. They partner with existing organizations, bringing compassion and the good news of Jesus Christ to those they interact with. For more information, see cpr-3.com.